The number one construction killer in any country is falling from heights, and this is principally due to the lack of proper edge protection in a variety of construction tasks. This work accounts for more than half of all deaths in the industry every year, and a significant amount of all major and more than three day lost time injuries. The most frequent problem is inadequate scaffolding, with no proper access or guard rails to prevent falls. Scaffolding is often erected by unqualified operatives, and is sometimes improvised, using unsuitable materials. Apart from scaffolding problems, other causes of falls include unprotected openings in buildings, lack of edge protection in roof work, lack of crawling boards on fragile roofs, demolition work and inappropriate use of ladders and hoists. The poor selection, use and maintenance of equipment causes falls, for example, using a ladder because it’s easier than erecting a tower scaffold. Ladders should only be used for low risk, short duration work, for example, work which takes minutes, not hours to complete. Research in the UK shows that 60% of all major injuries are caused by falls from height of below 2 metres, commonly from a ladder. Traditionally, significant risk concerning working at height has begun with work over 2 metres. The figure above regarding major injuries proves this to be a mistake. All work at height where there is a significant risk of a fall liable to cause personal injury should be risk assessed and appropriate controls implemented. This assessment might be made by the employer, the self-employed, and/or any person that oversees the work of others within their control (for example facilities managers or building owners who may contract others to work at height). In order to minimise the risk from such work, a risk assessment must be conducted in advance in order to decide what realistic fall protection is available. Remember risk is a combination of two factors - likelihood and severity; how likely is the person to fall and how bad will the consequence of the fall be? As well as the risks posed by the work at height itself, consider those caused by falling objects, or by accessing the work location. For example, climbing on and off a roof, or using ladders can pose significant risks. The risk assessments should apply to all existing places of work and means of access for work at height, collective fall prevention (e.g. guardrails and working platforms), collective fall arrest (e.g. nets, airbags), personal fall protection (e.g. work restraints, fall arrest). Assessments should be designed to reduce this risk and the number of related injuries each year. Working at height risk assessment must consider the following issues. This would include issues such as sloping, uneven or soft ground conditions; obstructions such as steelwork, pipework or overhangs; any fragile surfaces and maximum floor loadings. All work at height risk assessments must consider the possibility of adverse weather and its impact on the health and safety of the worker. Rain, snow and ice increase the risk of slips on a roof. High winds can mean that handling large objects such as roofing sheets is unsafe since the person and/or roof sheet can be blown off the roof. High winds can also vibrate loose couplings on scaffolds. Low temperatures can also make some roofing materials especially brittle, so increasing the risk of falling through fragile roof materials, such as plastic roof lights. Rain, snow and high winds all carry an increased health risk to the worker form localised cooling of the extremities (frostbite) and general cooling of the body core (hypothermia) which can be dangerous. Sandstorms can be a consideration since they can severely limit visibility, so a crane operator may not be able to see the worker who is operating from a suspended basket on the end of the crane. Lightning can be another consideration during work at height activities such as steel erection. You must ensure that any work at height is postponed if weather conditions present a danger to the health and safety of workers. How will the workers get up to and down from the work at height? Portable ladders are not the most preferred option since they do not prevent falls or limit the consequences of a fall. Furthermore, they also require three points of contact, which is not always possible when loads are being carried. It is preferred, where possible, to provide temporary stairs or scaffold access towers with internal stairs, rather than portable ladders. Longer duration or regular jobs generally justify a better standard of fall protection, e.g. a tower scaffold, podium step or cherry picker, rather than a ladder or stepladder. A ladder or stepladder may be acceptable for short duration work, e.g. replacing a light bulb, where building a tower or podium would not be reasonable because the task itself takes only a few seconds to do. But, installing several rows of light bulbs or fluorescent strips in a false ceiling refurbishment may justify the use of a tower or podium steps, because the task takes longer, so the likelihood of a fall increases. Roofing materials such as asbestos cement, plastic or glass are unlikely to bear the weight of a person. Asbestos sheets deteriorate over time leaving the remaining material in a particularly fragile state. Similarly, plastic roof lights deteriorate due to the effects of ultra violet light from the sun leaving them brittle. Some materials are designed not to be load bearing and where this is the case they must be accompanied with an appropriate warning sign. Where a person must work on fragile roofs we must ensure wherever possible that suitable platforms, coverings, guardrails and the like are provided (and used) to minimise the risk. Where a risk of a person at work falling remains, do all that is ‘reasonably practicable’ to ensure suitable and sufficient measures are implemented to minimise the consequences of a fall. If you have to use a fall arrest system you must make sure there is adequate clearance for it to deploy, so the user does not hit an obstruction or the ground before the fall is stopped. If you have to use nets or airbags they should be located as close as possible to the working level because they do not work as effectively if the fall distance is too great. Nets assume that there are suitable strong points to attach the safety net to. Air bags prohibit all work at ground floor level within that area. Basic care for fall protection safety equipment will prolong the life of the equipment and contribute towards the performance of its vital safety function. Proper storage and maintenance after use is as important as cleaning the equipment of dirt, corrosives or contaminants. The storage area should be clean, dry and free of exposure to fumes or corrosive elements. All work equipment and personal protective equipment should be regularly inspected by a competent person. There are a wide range of possible causes of degradation of materials used for work at height, including abuse, general wear and tear, edge/surface damage, weather,?dirt, grit, chemicals, dropping, subjection to excessive loading, falls. Where fall restraint/fall arrest equipment is concerned the textiles deteriorate slowly with age regardless of use. However, the most common cause of strength loss in textile equipment is through abrasion - either by grit working into the strands or by chafing against sharp or rough edges - or by other damage such as cuts. All of these defects are observable by inspection. Where a worker has fallen from height but has been wearing a fall arrest system, such as a harness, it is vital that a rescue can be carried out quickly where the worker is suspended. This is very important due to the phenomenon called ‘suspension trauma’, which is one of the effects of being suspended in a harness with the tightening of the leg straps that bear the body weight of the suspended person. Gravity pulls the blood down into the legs (venous pooling). This pooling of blood in the legs reduces the amount of blood flowing in the body and so the heart rate increases, and breathing increases to maintain the flow of oxygenated blood to the brain and organs. When this fails, the heart rate slows and the casualty faints. This reduced heart rate can critically reduce both the quality and quantity of oxygenated blood to the brain and other vital organs, with serious consequences of kidney failure or brain damage. Therefore it is important that rescue procedure is developed and practiced. It is not acceptable just to rely on the emergency services. Emergency procedures need to be considered for all reasonably foreseeable circumstances. The measures need to be covered in the risk assessment and planned prior to the work activity being carried out. The key is to get the person down safely in the shortest possible time, and before the emergency service response. When selecting work equipment look at all the risks, not just those associated with the ‘use’ phase. It may take two or more people to assemble a mobile tower scaffold to get onto a roof and install temporary edge protection, whereas the repair may need only one person on the roof, putting several people at risk so one person can work safely. A better solution would be to use a cherry picker (mobile elevated working platform), so one person can perform the task safely from the working platform. This avoids others being put at risk during set up and dismantling. Where the riskassessment identifies a significant likelihood of violent, unexpected movement, such as a vehicle colliding with the MEWP on a road, then the use of a restraint harness and line should also be considered in order to prevent the user being thrown out of the working platform. There are even more risks associated with work on a fragile fibre/asbestos cement roof. Where possible, use a cherry picker or tower scaffold to access and repair a leaking skylight. This will remove risks associated with setting up and dismantling work equipment on the roof. Collective protection is equipment which can protect more than one person and, once properly installed or erected, does not require any action by them to make sure it will work. These protect all workers without the need for restrictive working lines or harnesses. Examples of collective protection which prevents a fall include, scaffolds,?tower scaffolds and cherry pickers, which have guard rails and equipment which minimises the consequences of a fall - this would include nets and airbags. Personal protection is equipment which protects only the user/wearer and requires action by the individual, such as properly wearing and adjusting it for it to work. 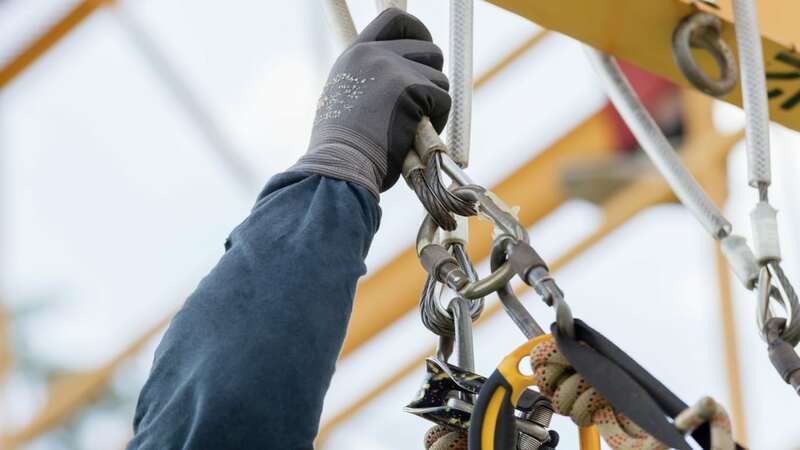 Examples include work restraint equipment, which prevents a fall and fall arrest equipment, such as inertia reel equipment which minimises the consequences of a fall, as well as rope access systems such as a boatswain’s chair. Why give priority to collective measures? Collective measures have several advantages. They are easier to use, protect everyone at risk in the work area and need less effort in terms of maintenance and user training. Personal measures have disadvantages - they require a high level of training and maintenance, and they only protect the user. It has long been known that workers are unreliable and even when issued suitable worker restraint/fall arrest equipment can fail to use it correctly e.g. not clip onto the strong point. Additionally, even falling just a short distance can generate extremely high loads on the user’s body, with point pressures exceeding 1,500kg. Without a shock absorber built into the fall arrest system these forces are likely to severely injure the worker and can even result in a fatality. Where the work is fast moving, short duration or difficult access, it is sometimes only realistic to use a ladder or ‘hop up’, but only if the work is low risk and of short duration, and does not require both hands at any time to complete the activity. Competence concerns an individual’s mental and physical suitability for a task. This is important because if someone has a fear of heights no amount of training will make them competent for working at height. So all of the above will only work if all workers are competent and suitably supervised against the assessed risks, and in the safe systems of work. Information and instruction should be provided on the nature of the hazards and control measures arising from the risk assessment. Levels of supervision can be determined based on the risk assessment and other factors linked to the activity including type of work, equipment used, duration. Regular refresher training should be considered in order to prevent ‘skill fade’.